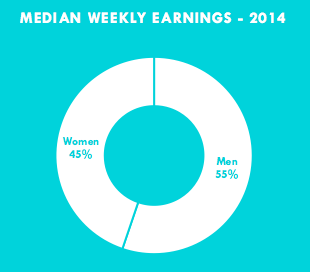 What is 'the gender pay gap'? This perception, along with prevailing cultural and societal norms have contributed to what is known as 'the gender pay gap'. Countless independent and government sponsored studies have yielded the same results - across all industries women are paid significantly less for doing the same job as their male counterparts with the same or similar qualifications. In addition to the disparity in pay, there is a perception that some professions are more suited for men instead of women, regardless of previous education. The idea that women aren't capable of achieving success in a field has lead to overwhelmingly male-centric industries, most notably in science, technology, math and engineering (STEM). Workforce Education Centers have a unique opportunity. Unlike higher education institutions, they have the unique ability to set hiring requirements for employers. Brooklyn Workforce Initiative, located in Brooklyn, NY, places all graduates at companies that have a minimum starting salary of $12 - $13, guaranteeing that all graduates are receiving equal pay for the same skill set. In addition, Workforce Education Centers generally teach practical skills with the goal of meeting certification requirements in high demand fields. Teaching the right combination of practical and professional skills - including having leaders of all genders involved in presentations or curriculum creation - can better prepare women for a competitive workplace.